This fry food drastically cuts your small fry losses during those first few days to a week after they become free swimming. 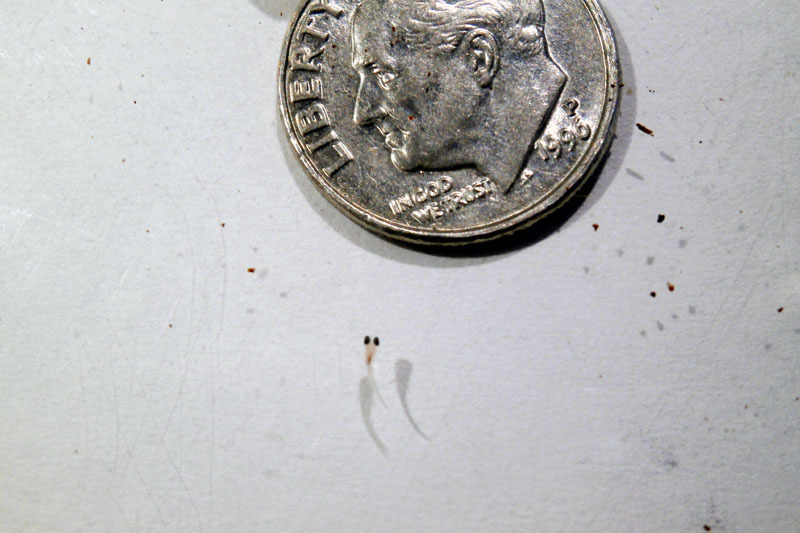 That critical period when they are not yet large enough for micro worms or baby brine shrimp is when most losses occur. Green water and infusoria are the classic first foods suggested for extremely small fry. Super Fry is actually smaller than both of these foods! A small bit of this food goes a long way, and the 30 gram portion shown here above is enough for several very large spawns. Some sinks, some floats and some bobs along in midstream to accommodate all your fry. It is the perfect first food for newly free swimming Betta, Rainbow, Cyprinid, Discus, Cories and all fry that need extremely small food on the order of infusoria and green water for the first few days. It saves more of my smallest killi fry than any other food, and some killi fry are even smaller than this guy below. He is all eyes and that is a dime he is swimming over! In formulating this food I have brought to the hobby ingredients and nutrients from commercial aquaculture, where they are dealing with larvae, smaller than any fry. 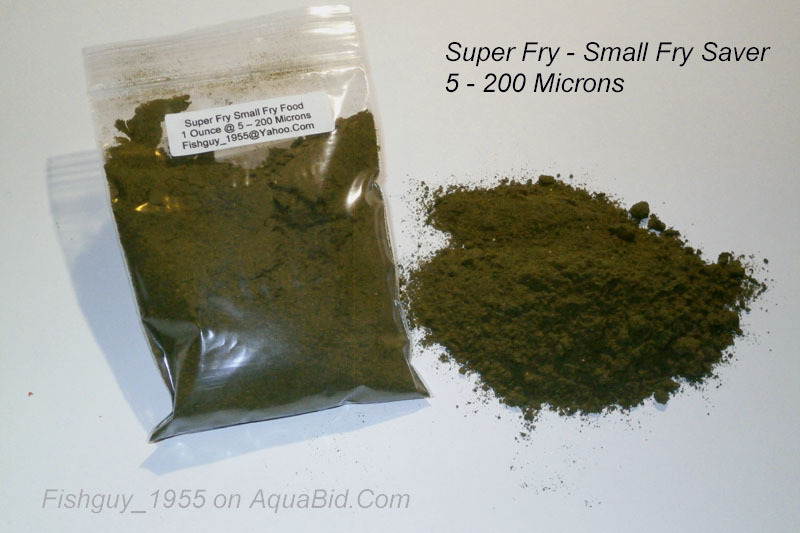 The recipe for Super Fry is proprietary, but I can tell you it has an overall protein content of 56% including a very high percentage of easily digested marine proteins. It balances this with a generous 18% of highly unsaturated lipids, and is vitamin enriched including a generous amount of natural astaxanthins. Shipping for this auction is $2.75 for USPS First Class Mail. PayPal is preferred but US Postal Money Orders are also accepted. I'll send you a Paypal invoice at the close of the auction and will ship to your Paypal shipping address unless you request otherwise. Please wait for my invoice and use it to make payment. I do not accept PayPal gift payments or transfers. Thanks for viewing my auction and best of luck with those small fry!